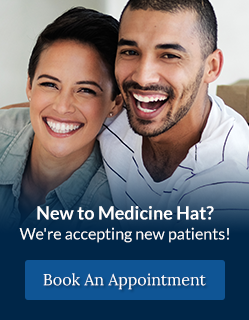 At River Dental in Medicine Hat, Alberta, our dentists and hygienists recommend a general hygiene check up two times per year to help maintain your oral health. We are dedicated to your oral health. We recommend that you visit your hygienist at least once every six months. Daily flossing and regular brushing are very important to maintain the health of your teeth and gums. When you visit our office for your hygiene appointment, your dental health team will also provide you with diagnostic services. These include oral examinations, digital x-rays as well as oral cancer screenings. We know the importance of helping our patients prevent oral disease before it happens. Through routine checkups and routine cleanings with your dental hygienist, we can help you prevent oral health issues and maintain a healthy smile.